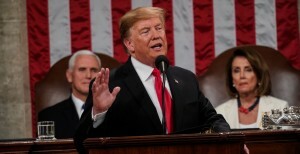 The 2019 State of the Union Address by President Trump tonight comes down to the same thing with the previous 3 Presidents (Clinton, Bush & Obama) - do you believe what they are saying. Are they saying things that have gotten positive reactions from focus groups? Are they just repeating the same partisan messages that we always hear? Are they saying things that they actually mean? Are those things, the same things that you care about? Did you believe Donald Trump when he says he wants unity? Did you believe Stacey Abrams in the Democrat response when she said she wanted unity? If they both meant it and you believe them both, then we have a chance. If one is disingenuous, then we don't. I'm afraid that is what tonight tells us, one is disingenuous. For example, Do you believe Trump's review of his record so far? Yes. Do you believe Abrams review of Trump's accomplishments? No. She said wages were down, when they are up. Not much, but up. Along with the low unemployment and jobs growth, how can she be saying things are so bad. This makes no sense, and is, therefore, partisan positioning and not believable. Did you believe Trump when he listed nonpartisan items he has worked on, like the farm bill, VA accountability, opioid crisis and criminal justice reform? Yes. Why then did the Democrats not stand and applaud? Did you wonder why Democrat law makers were not happy with these additional budget proposals: -Infrastructure -drug price transparency –eliminate HIV in the US in 10 years –childhood cancer These are not necessarily conservative priority issues. They are issues for unity in America. Why not support them? They did support the pre-existing conditions and paid family leave proposal with a standing ovation, then immediately sat down when this was immediately followed by an admonition of post term abortion. Did you believe Trump when he said he believes legal immigrants strengthen our society? Yes. He married two, employs many. No reason not to believe that, unless you follow the media hype and misrepresentation of his campaign statements. Do you believe he despises illegal immigrants? Yes. Especially those who are criminals. Do you believe Democrats when they say immigrants are the backbone of our country? Yes. Do you believe them when they refuse to separate legal from illegal immigration in their messaging? Is it the same thing? Did you believe Stacy Abrams when she said compassion does not equal open borders? No, no and no. Do you believe Abrams when she said Trump's shutdown was a political stunt? Yes. And, all Congressional politicians, especially Pelosi and Schumer, were part of the stunt by not negotiating in good faith. Do you believe Trump wants to negotiate in good faith on the border security issue? Yes. He has offered changes in his position that have been asked for by Dems, yet they have not moved one inch to accommodate his positions. Did you believe Trump when he said we should be putting country not party first? Yes. Despite media misrepresentation to the opposite, he is not ideological. Did you believe Abrams when she said she did not want Trump to fail? No. 40 Dems got elected to Congress under the umbrella of impeachment and the media has spent two years helping them with the Mueller Russia investigation, all designed to get rid of him. Disingenuous to the extreme! Did you believe Abrams when she said she did not want politicians to pick their voters? No. That is what all the voter suppression 'BS' is all about. No one was turned away with a legal ballot. Many were turned away without one. And, many voted without one. She lost a close race and wants to blame voter suppression. Reps lost close races and want to blame voter fraud. Dems believe in voter suppression. Reps believe in voter fraud. Do you believe Trump when he speaks of God? Yes. Do you believe Abrams when she speaks of faith? Yes. Do you believe Dems care about faith? No. They took God out of their platform in 2012 and asked to have God taken out of the oath of office last week. If you are a person of faith and are a one issue voter ( believing in pro-choice or climate change for example) then if you vote Democrat on those issues, you give up your faith to vote those issues. Did you believe Trump when he said the state of our union is strong? Yes, based on results. No, based on attitude and divisions. Did you believe Abrams grim picture of America? No. This was clearly partisan political posturing. Higher wages, Trump doesn't tell the truth, attacking Republicans as not understanding real life, gun safety, education, racism, reproductive rights, etc., were all mentioned in her speech. A few surprises: 1. The Democrat 'mob' didn't act like one during the speech. Good planning by Pelosi to keep that under control. 2. The white dresses worn by Democrat women however made it easier to see everyone who wasn't standing, especially when they should have been standing regarding policies and programs they agree with or support for America. 3. 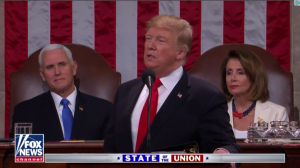 Illegal immigrants invited to SOTU by Democrats? Why weren't they arrested? 4. Mazie Hirono would not stand or applaud anything. She is an embarrassment! 5. Pelosi did not introduce the President. Probably a good move. No way she would have been believable. 6. Pelosi's facial expressions and body language were a distraction, which may have been by design. She fumbled with a copy of the speech, provided unusual mouth movements, was the "queen of condescending applause", and surveyed the audience as if looking for people not doing what they were told. She resembled an orchestra leader at times. That is not what the Congress of the US is supposed to be about. 7. Stacey Abrams had a commanding presence. She was chosen because she is black and because the DNC did not want to show preference to any of the 20+ Democrat Presidential candidates for 2020. 8. Trump took a couple of shots; results vs resistance and partisan investigations, and he ignored climate change and gun control. There are clearly issues that have each side entrenched; border wall, immigration reform, socialism, abortion, climate change, foreign policy, gun control, racism, trade, to list a few. Can't we agree on all the others? Bernie & AOC were forced to sit for Trump's warning against Socialism! Can't we agree we don't want to be the next Venezuela? Who do you believe wants to work together for a better America? Trump. Because he believes in America. Who do you believe wants their version of a better America accepted without negotiation? Dems, because they don't believe in debate and discussion of issues. You are evil, and demonized, if you don't agree with them. In the next 10 days we will find out who really wants to work together on one important issue. PS. Ever wonder why the New York Times or other left wing news organizations only fact check Trump?